Where happiness dwells. . . The courtyard. 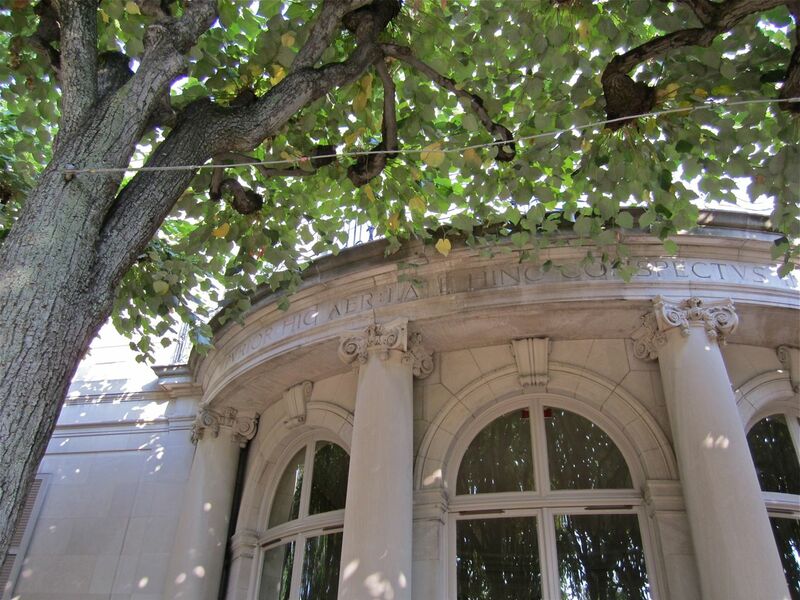 The original linden trees were imported from Europe when the house was built. 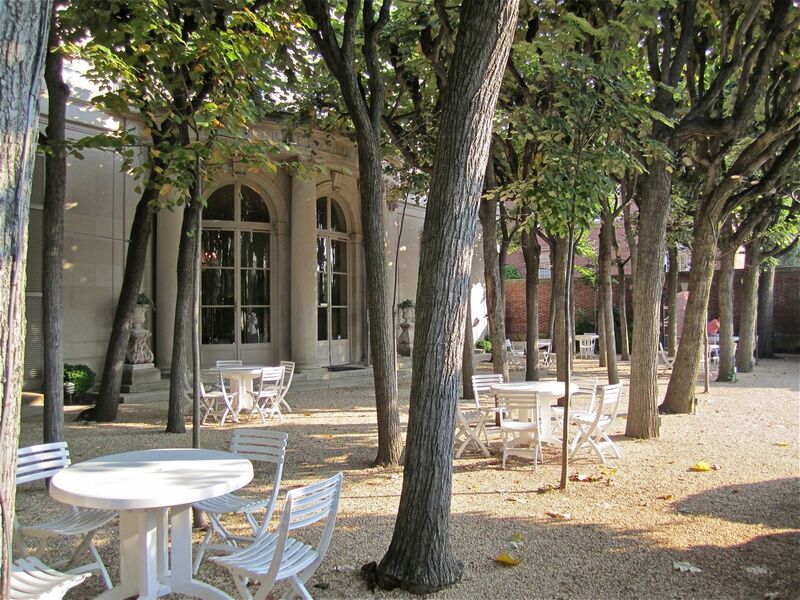 I love to see rows of pollarded trees in French squares and courtyards. The quality of light and shade they produce, the formal rhythm of their trunks, and the sculptural qualities of their branches and old “knuckles” have a timeless beauty for me. 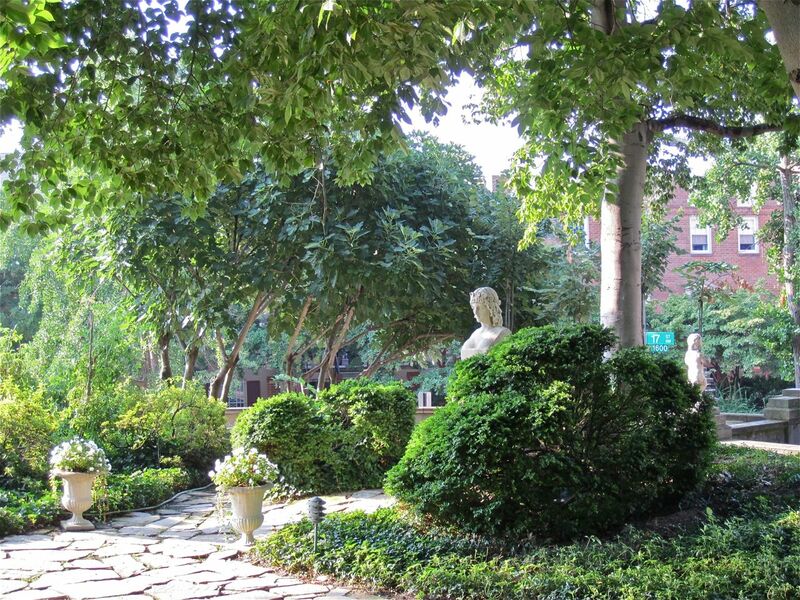 Pollarded trees aren’t common in the United States, so I was surprised and delighted when I walked into the lovely, serene courtyard of Meridian House on Friday morning. Meridian House in Northwest D.C. (just a stone’s throw from Meridian Hill Park on 16th Street) is home to the Meridian International Center. Since 1960, the Center’s mission has been to advance American public and cultural diplomacy efforts. It manages international visitor exchanges, holds cultural exhibitions, and hosts conferences and seminars. 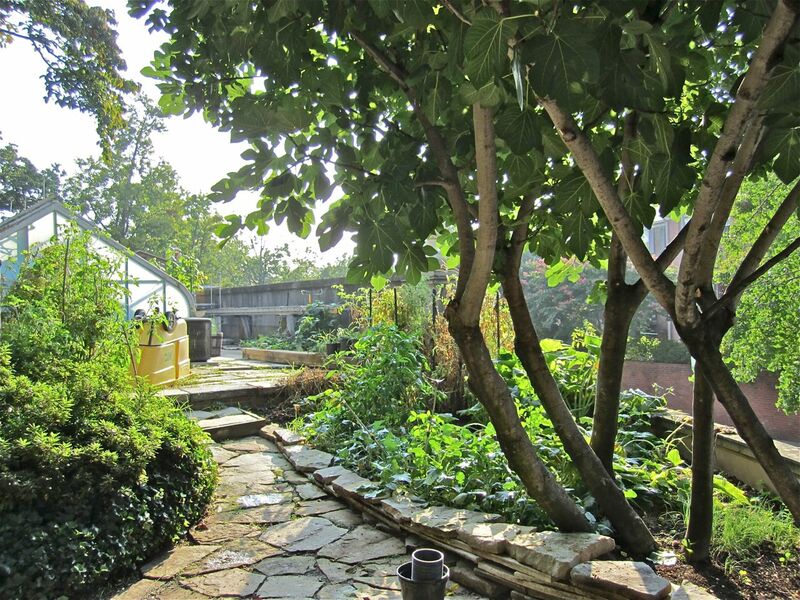 I was able to see it — and the garden — last week, when I attended a seminar on Rwanda. The house, built in 1920 as the home of diplomat Irwin Boyle Laughlin, was designed by architect John Russell Pope, who also designed the Jefferson Memorial, the National Gallery, and the National Archives. 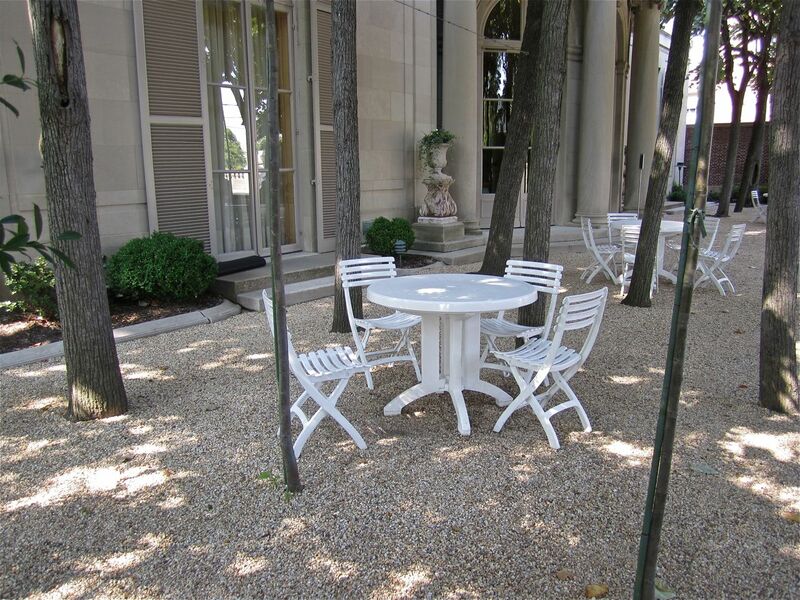 The style of the house, both inside and out, is neoclassical and French. 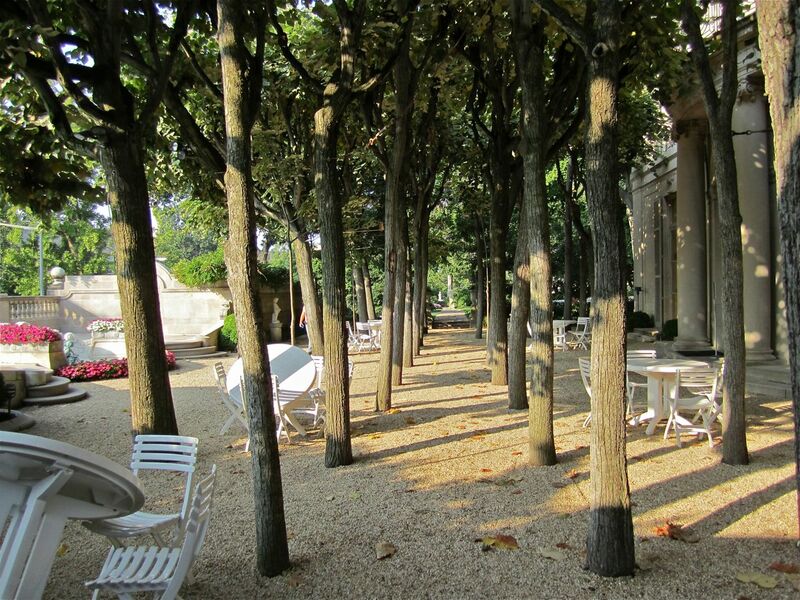 The rectangular courtyard just outside the house’s reception rooms is paved in pea gravel and canopied by 40 pollarded linden trees, which were imported from Europe when the house was built (more links on pollarding are here and here and here). 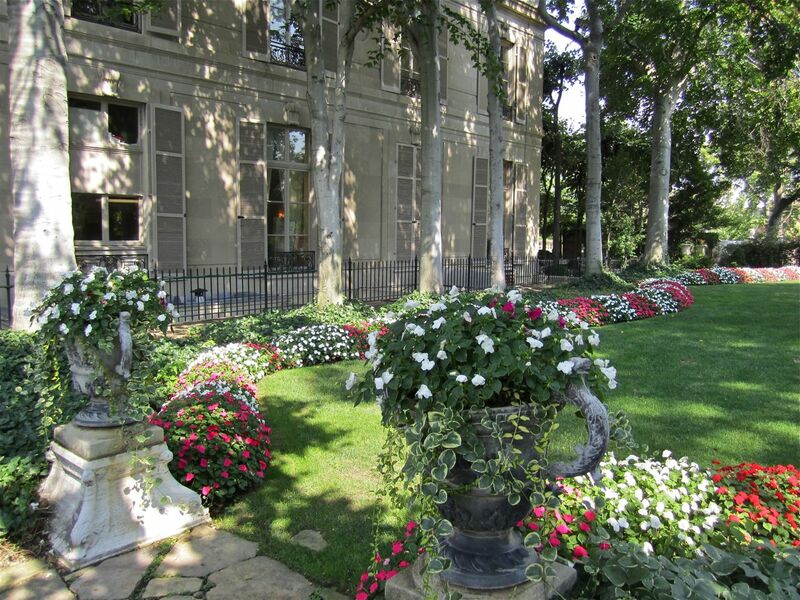 The side garden has a large lawn and planting beds bordered in pink and white impatiens. The design of both areas is largely original to the house. The courtyard in early morning. Click on the photos to enlarge them. Young trees the size of poles have been planted to replace the old. 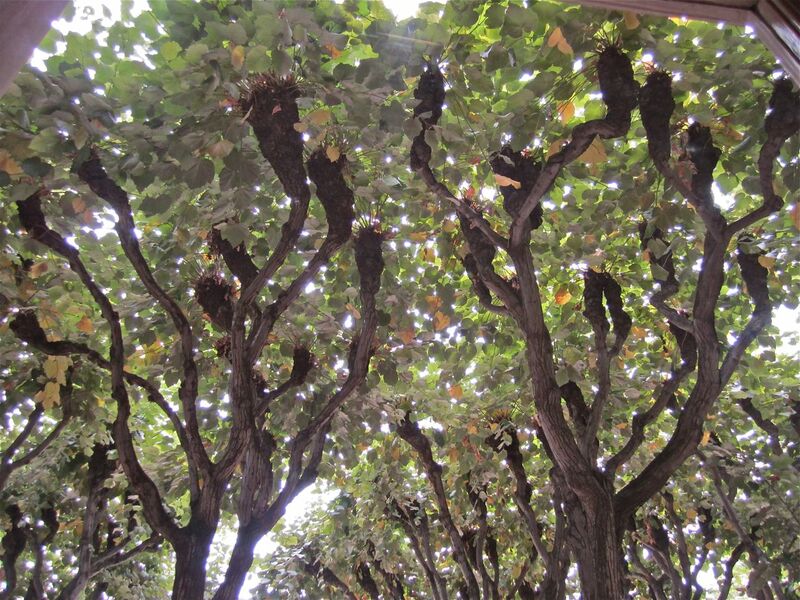 The umbrella-like canopy of the pollarded linden trees. The old “knuckles” of the trees. Moving from the courtyard to the side garden. 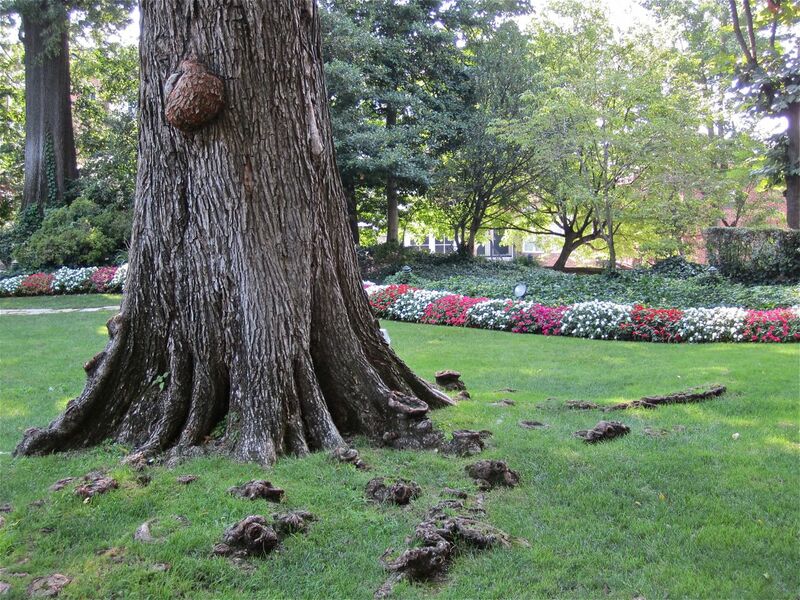 An old oak in the center of the lawn. Its roots are protruding into the grass. Looking up into the oak. 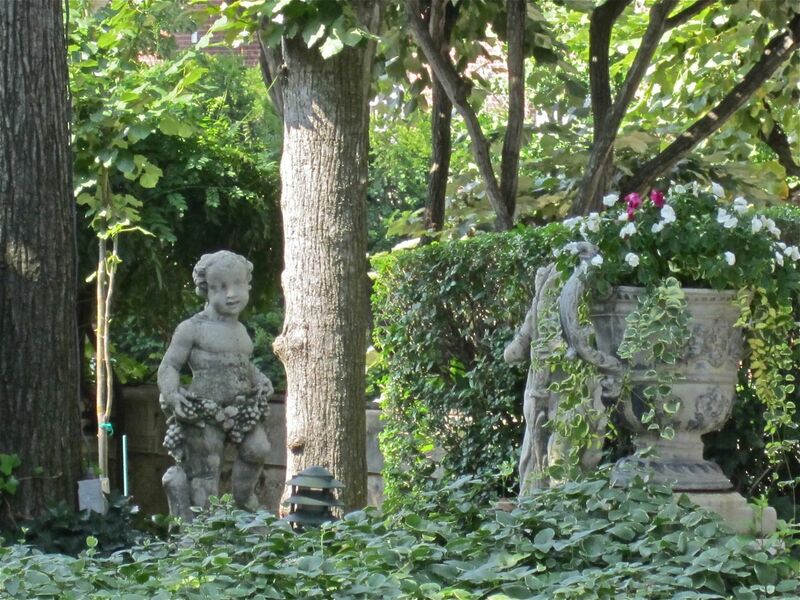 The statues throughout the garden are original to the house. 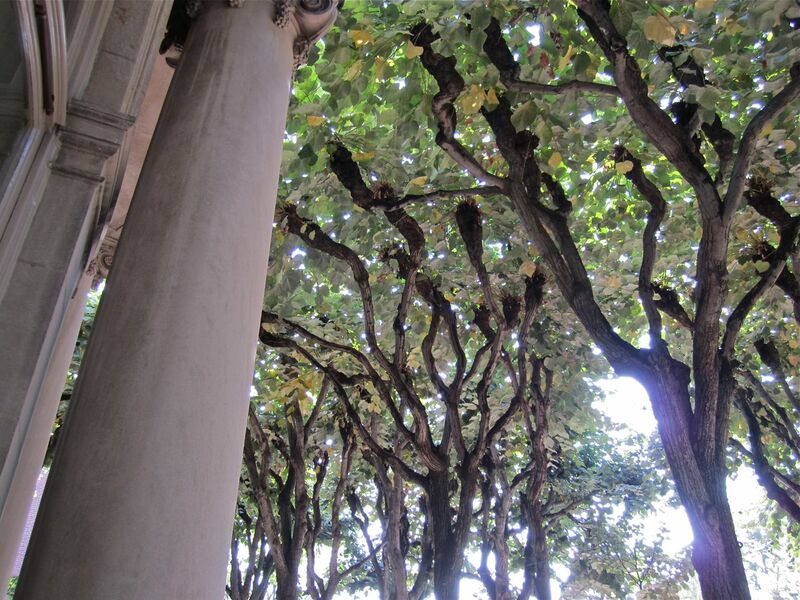 Several limbed-up fig trees in the southwest corner. The staff have planted some vegetables around the greenhouse on the south side. 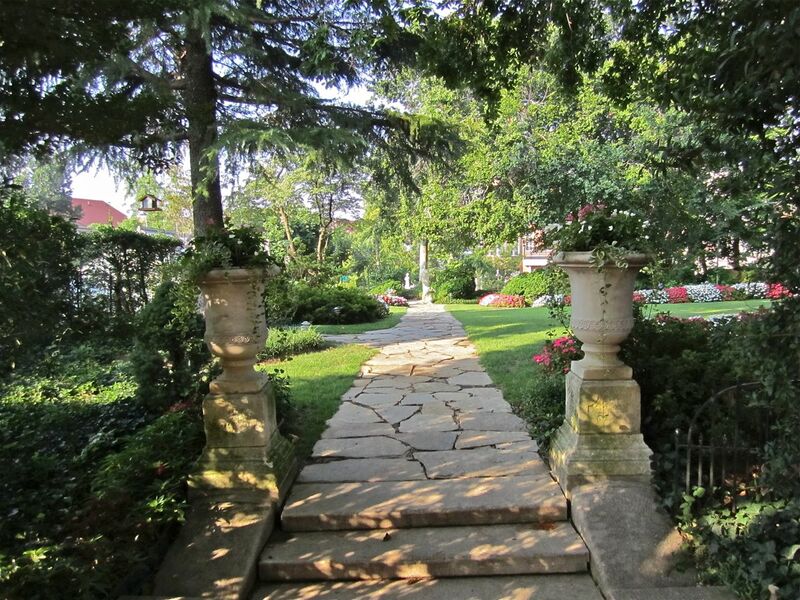 A walkway along the west perimeter of the garden. Leaving the house at 1630 Crescent Place. 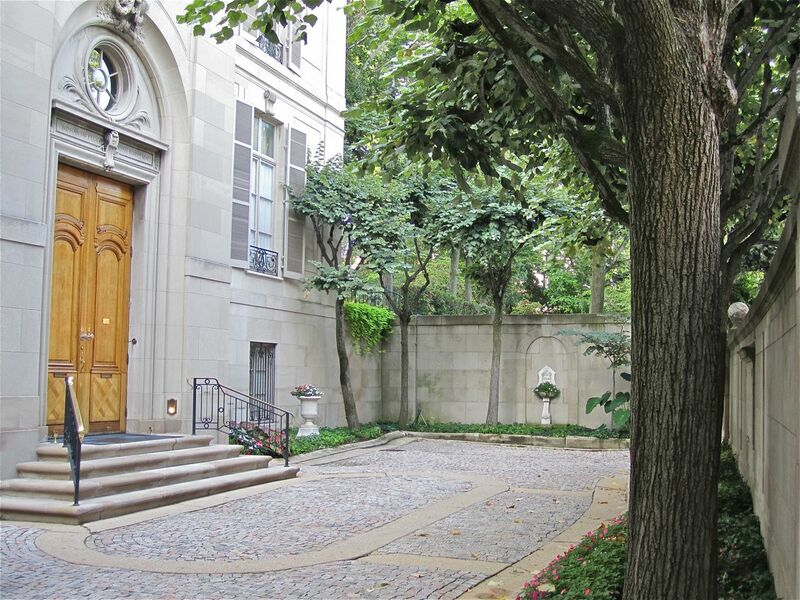 Not surprisingly, Meridian House is one of the outstanding wedding venues of Washington, D.C.
To see more photos of the courtyard and garden, click on “Continue reading” below and click on the thumbnails in the gallery to enlarge them. A detail at the Crescent Place entrance. Elephant’s ear and a small linden at the front of the house. A small lower garden on the north side. Paths bordered by beds of boxwood and azaleas weave along the back of the garden on the west side. At the back of the garden, a retaining wall and bench. 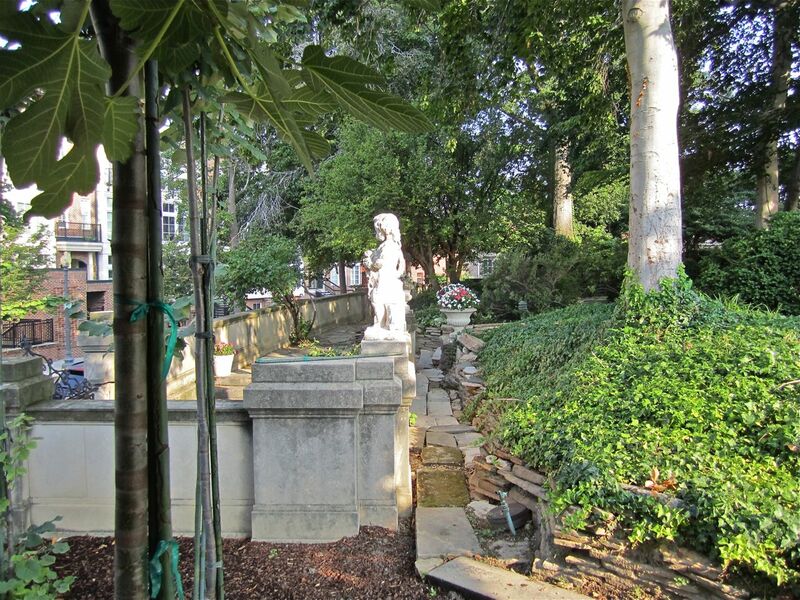 Statuary and neighboring apartment buildings. The staff have planted some vegetables around the greenhouse. Several limbed-up fig trees in the corner. A greenhouse on the southwest side of the garden. Pink and white impatiens border all the beds. Its roots are protruding into the grass. An old oak in the center of the garden. The inscription is also inscribed on a house at the top of Rome’s Spanish Steps. At evening events, lanterns are hung from the wires between the trees. 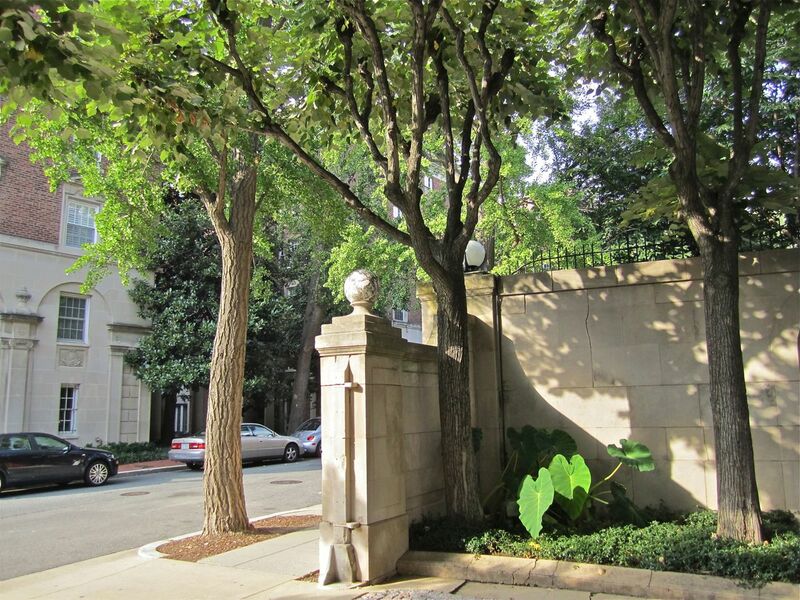 The gate leads to White-Meyer House, also designed by John Russell Pope. 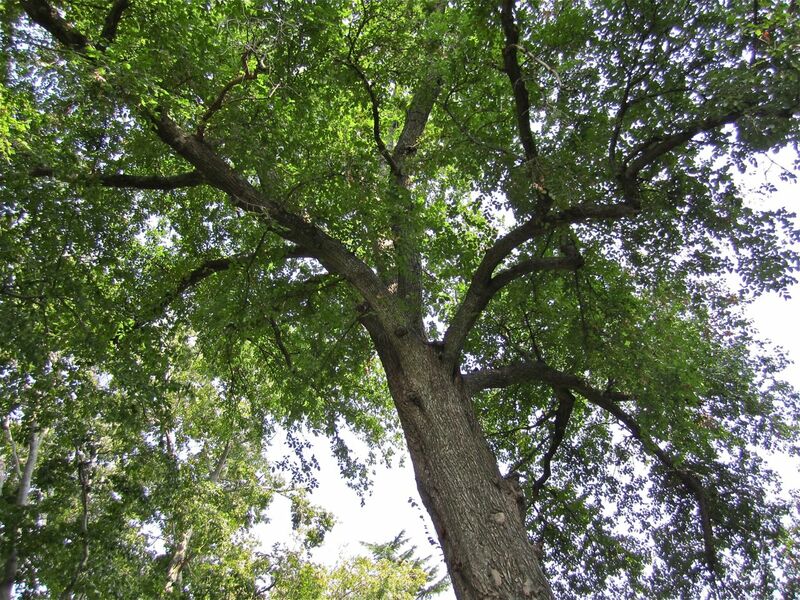 The original linden trees were imported from Europe when the house was built. The courtyard in early morning. It’s one of the hidden gems og DC. I went to a conference there and immediately made arrangements for Ron and I to have our wedding there. It was an amazing spot for a party. 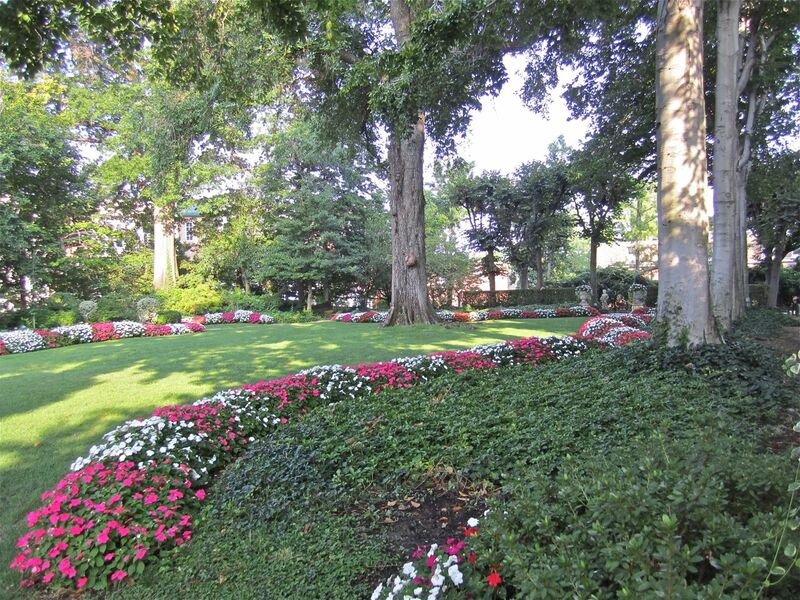 I’ve never been to the Meridian House butI love that there’s this beautiful garden tucked away in this city. I can see why people would want to have their weddings there. Thanks for sharing these pics! What a beautiful garden. Just looking at your photos made me feel serene. Thanks for sharing it.